National security spokesman Alejandro Poire said in a Twitter post that "Narco-corridos justify crime." Mexico City (CNN) -- Mexico's Sinaloa state has named a new target in the government's war on organized crime: bars, restaurants and night clubs that play songs glorifying drug trafficking. Those that do will have their licenses revoked, according to new rules published in the state's official register. "They can play other types of songs, but nothing that incites violence or justifies crimes," Sinaloa Gov. Mario Lopez Valdez said as he announced the measure this week. Federal lawmakers have suggested banning them, but the proposals haven't passed. Elijah Wald, author of the book, "Narcocorrido: A Journey into the Music of Drugs, Guns, and Guerrillas," has documented dozens of past attempts by politicians to stop the songs. "The pattern seems to be, when anything happens in the real world, let's crack down on the fantasy world," he said. "You know, it's nutty, but it makes a certain amount of sense, because it's something that the government can do, whereas the real violence is completely out of control." 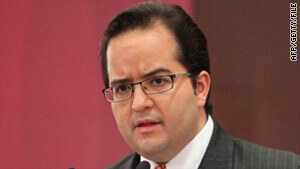 A top Mexican official praised the Sinaloa governor's move. "Narco-corridos justify crime .... Good for (Mario Lopez Valdez)," national security spokesman Alejandro Poire said in a Twitter post. On Thursday, he said silencing the songs is a key part of Mexico's "cultural fight" against violence. "The rhythm they dance to is that of the violence that harms many families in Mexico," Poire wrote in a blog post on an official government website. "It is not a matter of censorship because it isn't a moral matter; it is a matter of legality and stopping the growth of the culture of indifference and violence," he said. The owner of a night club in the state capital of Culiacan said he was annoyed by the government's decision, which he said would take a toll on his business. "We live in a state and a city where this music is played and the people like it," said the night club owner, who declined to give his name due to security concerns. The government is unfairly targeting the songs rather than dealing with crime, he said. "There are people that are doing bad things, and they are not going to stop doing them because we listen to cumbia or disco," he said. CNNMexico.com and CNN's Catherine E. Shoichet and Krupskaia Alis contributed to this report.